Watch our lookbook collaboration here! I love playing around the similar colors from a palette. These colors remind me of cotton candy from those carnivals. Here, my Unif shorts have different shades of pinks and purples, so I paired it with my pink floral head piece and my blush helgas. This is more of subtle combination, so it's soothing to the eye. I want the shorts to pop out more, so I wore my netted crop top with a sweetheart lining. The arm candy consists of lavenders and grays, loving the pastel mix! 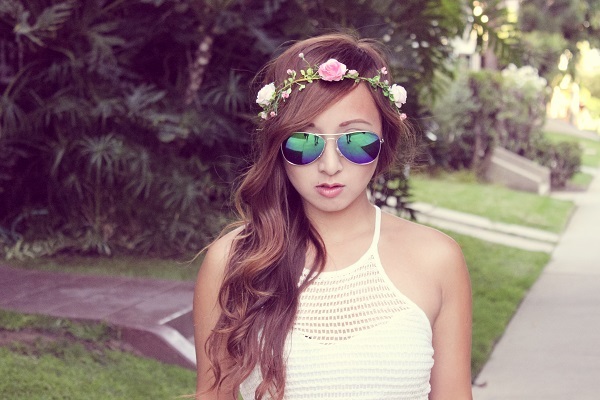 Finishing the look with these reflective sunglasses is just perfect! The shoes are perfect ! You look fab loved everything about this look.. Shoes and top..
First, you are so very cute. The shoes is just perfect and love the shorts, its so cool. Nice looks and love the photo-shoot. Thanks. Following you now via GFC and Bloglovin, hope you will follow back. love the floral crown! would love the follow back! Love this sweet look! The pastel tones are so pretty. Everything about it is so perfect, you look adorable!